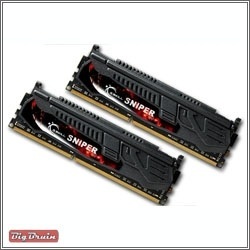 In their twelve years of doing business, G.Skill has developed a solid reputation for building high performance enthusiast grade system memory. Their goal is to offer superior memory products while keeping up with modern trends. While other memory companies have diversified and now offer other hardware (power supplies, coolers, etc. ), G.Skill has maintained its focus on memory based products by offering just system memory and solid state drives. 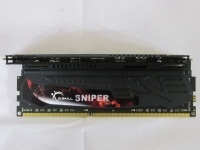 In this review we will take a look at G.Skill's Sniper 8GB 1600MHz DDR3 memory kit, as shown in the image above with its unique sniper motif heatspreader. This kit is comprised of two 4GB modules rated for 1600MHz, with timings of 9-9-9-24. Before taking a closer look at the kit provided for review, let's cover some of the features and specifications taken from the product listing on the G.Skill website. 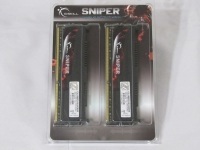 The image below shows an overview of the packaging used by G.Skill for this Sniper kit. It looks like just about any other memory kit I have used or seen, with the memory being held in two separate compartments inside a clear plastic case. On each piece there is a sticker where we get information on the kit, all of which has been detailed in the features and specifications section above. 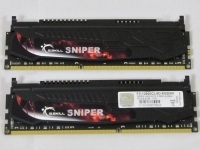 A closer look at a module from this kit shows the unique heatspreader design for G.Skill's Sniper 8GB 1600MHz DDR3 memory kit. These black heatspreaders have a unique asymmetrical profile with a G.Skill Sniper graphic on both sides. Underneath we see that the PCB is also black. The top edge of the modules shows that the heatspreaders make good contact with the memory chips; which are on both sides of the modules. The heatspreaders are not a single piece, rather two pieces attached to the memory chips. Finally, on each end there appears to be a clip for something to snap into; however there is no documentation on what it could be and memory fans attach on the sides, not the top.